Is there any particular moment where you wonder if you could “edit” that unnerving employment gap in your resume. 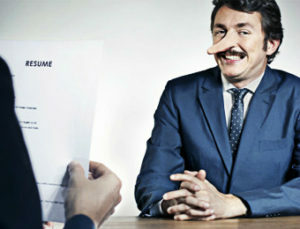 Lying in one’s resume is one of the most rampant problems among job seekers. Even some of the most “honest” people had lie on their resumes. In several surveys conducted, reports say that approximately 43% of the resumes out in the job market contain falsifications. This leads hiring managers at a greater risk of hiring unsuitable applicants. Now, hiring managers take more time analyzing and evaluating resumes to check their accuracy. This must be strictly practiced especially in jobs wherein the person’s life depended on the employment. For duties that are not concerned with the medical field, food and nutrition, as well as industries with no direct impact on human health, resume falsification risks may be little. Nonetheless, it is still there and discovery of the falsification can result to termination from one’s work. So why do some job seekers commit resume lies? One of the most common reasons is that applicants feel that their skills fall short of what is specified in the job announcements. Oftentimes, the seemingly “unrealistic” requirements contained in job announcements prompt these individuals to pad their resumes. By doing so, they think that once they got in, they can definitely do a far better job and eventually cover-up the misleading information that they have placed in their resumes. Frequently, applicants lie about their education. One may claim that they have obtained a certain degree wherein fact, they only spent a few hours and were not even way in the middle of obtaining a degree. Aside from claiming to have a degree, other applicants tend to omit the year they earned the degree to prevent the HR personnel from doing their math. Aside from these resume lies made by older candidates, there are other practices prevalent to newly graduates. One is that some who claim to have a certain GPA point grade higher than what they actually earned. On the other hand, others declare that they studied abroad or even did internship in both existing and non-existing companies. Some others state that they have acquired certain honors that they didn’t actually receive. Some job seekers pad their previous salaries to obtain a bigger offer. This is usually done by combining their regular salary to their incentives and bonus. However, prospective employers were able to block this up by asking for the applicant’s recent pay stub or tax return. This way, padded salaries are immediately caught or even prevented. Apart from manipulations due to lack of adequate skills or qualifications, there are resume cheats done because applicants fear of being discriminated. For one, age discrimination is one of the common problems faced by middle-aged applicants. So in order to avoid such discrimination, older applicants tend to trim off their experiences and remove dates from their resumes in order to prevent their resumes from telling their age. Some individuals have also moved the borderline between familiarity and proficiency when it comes to certain skills and application software know-how. One may claim proficiency in certain applications like Dreamweaver, Linux, or even Adobe Indesign when in fact, the only thing he can do with these programs is to open and close them. Such claims are eventually exposed during interviews or during the actual job. Apart from cheating with one’s software knowledge, applicants also lie with their language proficiency. These claims usually leave applicants embarrassed especially if the interviewer starts talking to them in the language that they claimed they are fluent at. Job seekers with criminal records are no stranger to committing resume lies. They perceived that since their drug abuse case occurred about some five years ago, their prospective employer would not be able to dig it out. However, further background investigations can expose it to their employers. We cannot blame applicants who lie. In this tough job market, desperate job seekers would utilize any means just to get employed. But, no matter how difficult it may seem, telling the truth is the best weapon that you can arm your application with. After all, every lie that you tell in the past will come back and haunt you.